Reptile calf sleeves are geared towards those men who want to compete and train in crossfit activities, but would like to protect their calves in the process. Who wants to show up for a date in shorts with banged up calves, and bloody shins. No one. That’s why these durable leg warmer like sleeves were developed by Guroo Active Wear. You can also wear them during weight training or parkour pursuits just as easily for extra protection and support during these strenuous activities. They are made of high spandex mesh for breathability so that they aren’t hot and won’t make you sweat harder than you already do. 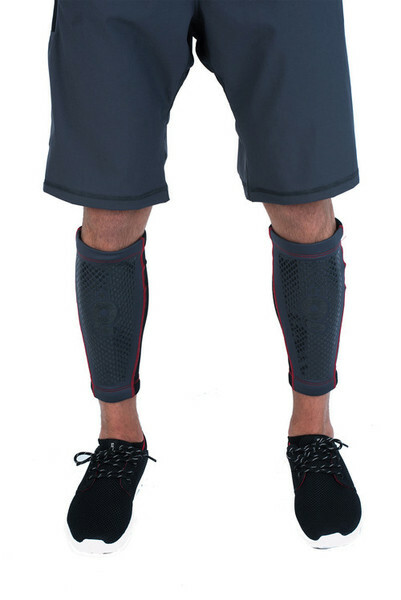 The padding is subtle, but effective at protecting the shins from scrapes, bumps, and bruises. The stitching is flat so that it doesn’t irritate or dig into your skin when you wear a pair of these reptile calf sleeves. At only around $55 per pair they are an affordable piece of workout gear that does offer you leg protection without having to wear pants. Workout shorts, or gym shorts with these is a fine look for the gym or outdoor circuit. They come in two different size ranges, small to medium and medium to large. All pairs are a combination of carbon grey and black to blend in with any of your gym clothing. You can use them over and over again by just washing them in cold water in a gentle cycle and then laying flat to dry. It takes hardly anytime at all to dry them since the fabric is meant to absorb sweat and dry quickly.